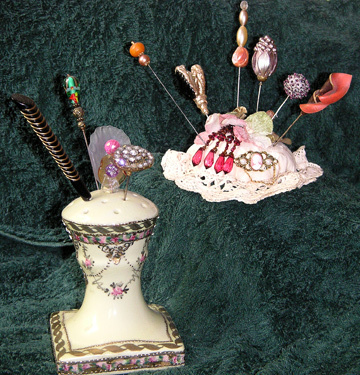 Love your hatpin collection! I have wondered about these before when I’ve visited antique stores. Thanks for sharing this info. I do so enjoy reading your posts about collectibles and the hatpins post is great. Those are beautiful, Karen! And very interesting history, thank you for sharing this! Wow, they are so lovely. I love the Holder too. and found your site. Want to tell you Hi and good luck on the collectable. You have a nice collection Karen. I also have an interest in hairpins, only the east Asian kind though they fascinate me. Some are truly ancient, up to 1000 years old! I am currently in china and there is an abundance of cheap hairpins that could sell for a lot in the US.